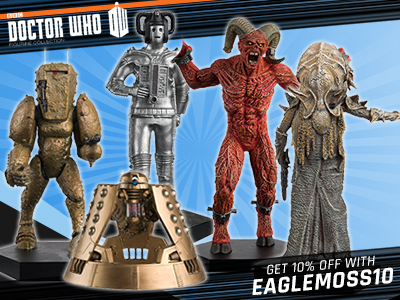 Exclusive Asylum of The Daleks set includes Paradigm Drone and Supreme Daleks PLUS Sound FX Bronze Dalek. When the Doctor, Amy and Rory are captured and brought before the Parliament of the Daleks, they naturally fear for their lives. 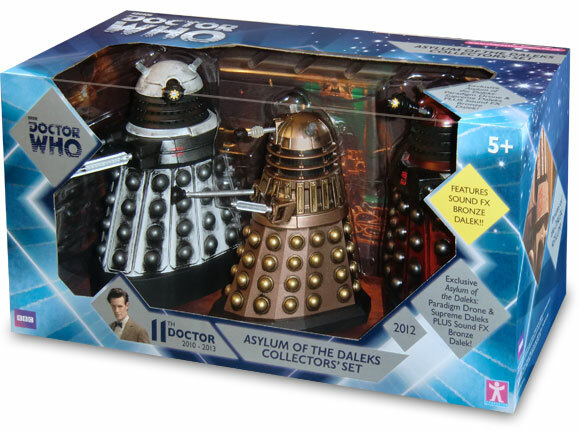 Expecting to be exterminated, they are surprised to be asked to save the Daleks, Humankind has somehow managed to enter the Dalek Asylum – a planet where insane and unruly Daleks are dumped. A spaceship has crash landed rupturing a hole in the planet’s defence shield. If humans can get In, then Daleks can get out! 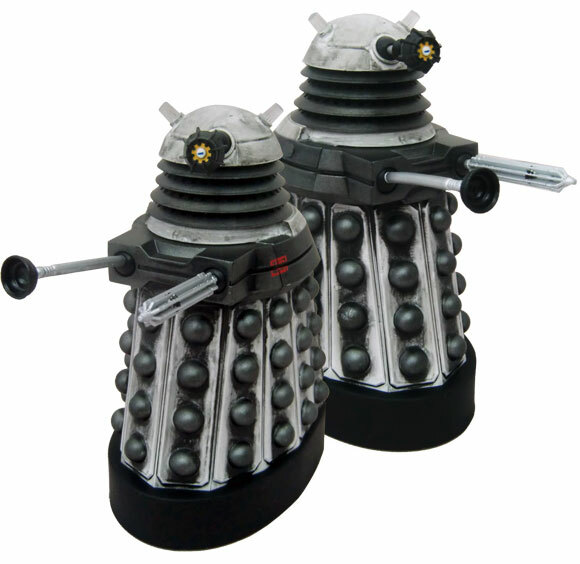 Genetic mutations housed in armoured travel machines, the Daleks are the distillation of all that is evil in the Universe. out the window for a soap-esque drama bomb. 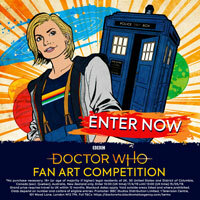 This is awesome for fans of the daleks. Also, I love the rusty/dirty design on them. Oh yeah, I’d forgotten about the free time zone play set. I got a Cold War one free when I bought this set. Might get this. 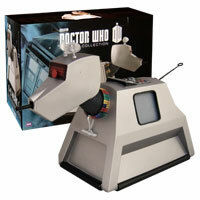 And the K9. Left it good for the price to drop. Ha bet its because no one is paying it either that or they want to shift them off the shelfs. 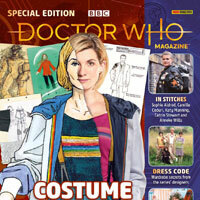 Is this just online or will it be reduced in stores as well? This set has always been priced to be reduced at future date. The twin packs were. And K9 def was. This set has been reduced to £19.99 from £29.99 so no longer has free p&p. On the plus side the price is now completely reasonable (so long as you’re planning on getting something else as well. Yeah £19.99 is a much more realistic price for this. Shame I paid £29.99. Oh well, at least I waited for the K-9 mark II and saved on that. 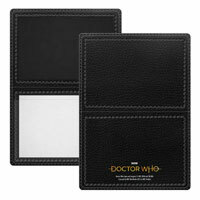 quite saddening that this set doesnt have as many comments as War doctor and Time of the doctor set. For a bunch of rereleases i rate this set very highly and i think the quality of this set is just as good as the other sets. True, these have very good detailing. 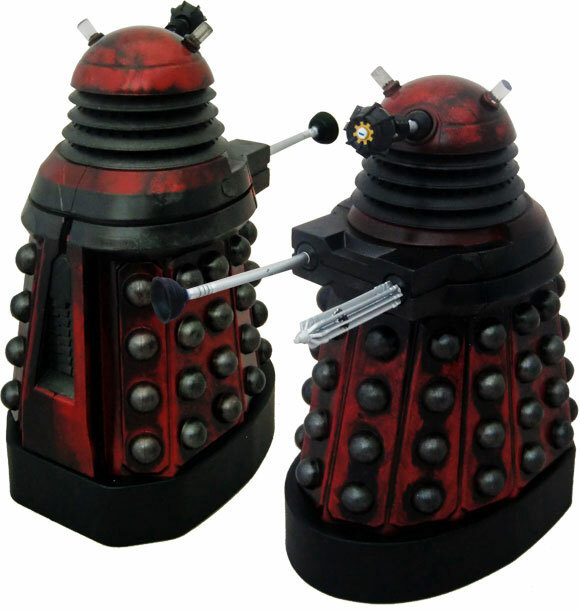 Could have included the special weapons dalek that got very little attention in the episode, but then it is still available by itself. But the special weapons Dalek is already dirty, so it would be exactly the same. My Asylum Supreme has a really, really loose gun. I don’t suppose there is anything I can do about this is there? Maybe you could take the gun out, rotate the ball, put some glue on it, rotate it back, and then let it dry then put the gun back in. 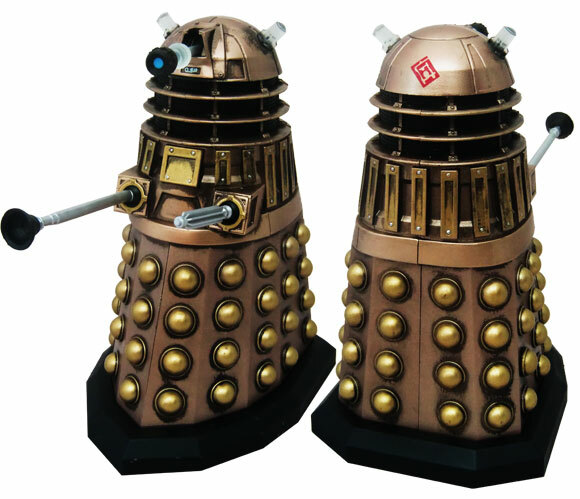 Is the sound FX Dalek the same size as the series 5 5 inch Progenitor Guardian gold Dalek? It should be out late 2015 sadly but it does have about 25 episodes i think i haven’t counted them for a while. Wow 25 episode! I Cant Wait! Do you have YouTube? BooBoo is it ok if I use your pictures for my website? 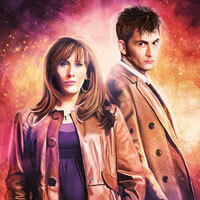 I will of course credit you! 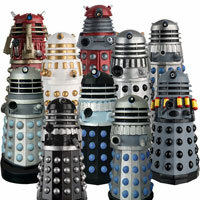 Does anyone else think/hope that the Paradigm Daleks will turn into the 60’s Daleks and hunt down the first doctor? Trying to find this set for $50-60 (About 31 pounds). Anyone know where I can find one? With shipping to the U.S.??? You will never find one for that amount. I love in the USA and I had my friend in London buy me my set and it cost about 20-25£ more pounds for protective tracking shipping. I think everyone would love to find one for that price. Although if u just buy it from Toys r Us you can get it for 30£! Thanks for telling me! I will look at ToysRUs. Loads of these in the lakeside Essex toys r us today. What else did they have ??? They had loads of wave 3 figures including the 12th Dr in costume, hide and angels play sets, spin and fly Tardis but not series 8 interior, mr potato head Dr’s and some of the new sonics. 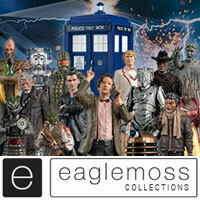 Also loads of the Union Jack dalek and the big remote controlled asylum dalek. My Asylum set arrived today. Even with the weathered effect the new paint job on the Drone is fantastic. Even better than last years Strategist. Hopefully a clean version is not that far behind. My Supreme is heavily weathered so it makes a nice Wedding of River Song variant. 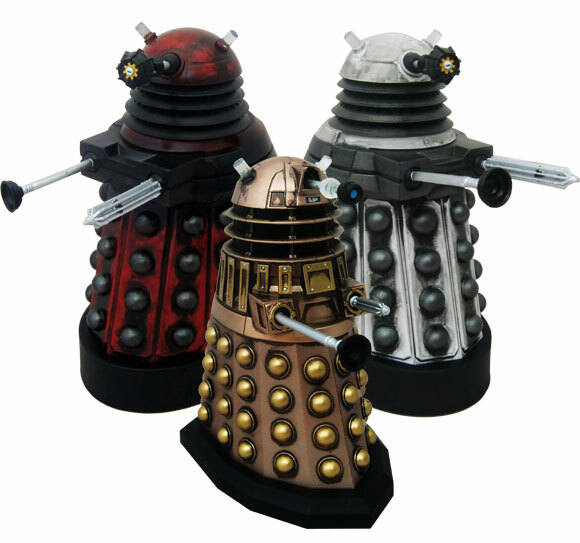 I’ve never liked the RTD Daleks but I am slightly disappointed that the 5″ inch Asylum version isn’t as weathered and rusty looking as it’s 3.75″ counterpart. All in all though it’s a very nice set. 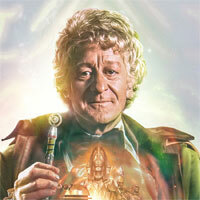 Here’s hoping the Classic set is still on the horizon. I agree with everything you just said! 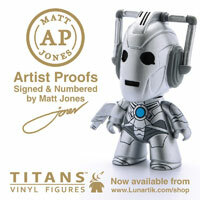 TRU in Stoke had 3 of these yesterday… 2 now, as I bought one! hasn’t the offer finished now? How comes they were available this morning? Where did the extra stock appear from?